This production of La Bohème features two Mimìs and Rodolfos, who each take on five performances of Puccini’s beloved opera. If you attend a Sunday or Friday performance, you’ll hear Jennifer Black and Michael Fabiano—both making their company debuts in these roles. 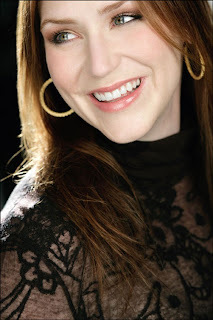 Today, we get to know Jennifer a little better; below, she tells us how she got her start in opera, what she thinks of Bohème, and what it was like to perform at Seattle Opera’s recent gala. For tickets and more info about La Bohème, visit www.seattleopera.org/LaBoheme. Welcome to Seattle! Could you tell us about your background, and how you became interested in opera? I grew up in Houston and I was in theater until the middle of my junior year of high school; I really wanted to be a straight actress. And I’d auditioned for the choir teacher and she wanted me to join, but because I was in theater I just didn’t have the time. Then, in my sophomore year, the theater and choir departments got together and did a musical—so I was able to go join choir. Do you remember your first experience with La Bohème? My voice teacher was in the Houston Grand Opera chorus, and one of the first assignments he gave me was “Donde lieta,” which is Mimì’s second aria. Most singers start out on Schubert or Mozart, but I started out on Puccini! This is an opera that most opera fans have seen many, many times—but it never seems to get old. Why do you think Bohème has endured the way it has? I think Puccini has the right balance of comedy and tragedy, and it’s a story that everybody can relate to on some level. There’s camaraderie, with the four guys goofing around on stage, and there are the two love stories—one very volatile, the other tragic and ending with death. We can always identify with at least one of the characters, depending on what’s going on in our lives, so that’s why I think it doesn’t get old. Sometimes people might identify with Colline, and other times they might identify with Mimì or Marcello. It stays fresh. In fact, I was telling one of the Artist Aides that no matter how many times I see La Bohème or perform it, there’s always something new that comes to me. When you’ve done it so many times, you become opinionated about it, and sometimes it’s hard to accept new ideas. But if you’re open to it, and you can see it from different angles, then I think the story becomes that much more powerful. Jennifer Black (Mimì) and Michael Fabiano (Rodolfo) in rehearsal for La Bohème. So, do you still get choked up when watching Bohème? Which of these characters do you relate to the most? I identify a lot with Mimì, and I appreciate her sacrifice. But I also definitely identify with Musetta in Act Four. She gets very protective of Mimì, and I tend to become very protective of my friends when I see that they’re in a compromised position. Jennifer Black makes her Seattle Opera debut as Mimì. Here she's pictured in staging rehearsals for La Bohème. Have you sung Musetta before? Actually, yes. We took La Bohème on tour with Western Opera Theater, which has since been cancelled but used to be part of San Francisco Opera, and I was Musetta for like six months. It was triple cast, so when we weren’t singing the lead roles, we were in the chorus. So I got to know this opera like the back of my hand. Musetta was a big challenge for me, but she taught me a lot, because I don’t have her outsized personality. I’m more subtle. Well, gosh, there are so many favorite moments. I love watching the guys in Acts One and Four, when they’re in the garret. I love being part of Act Two as Mimì, as an observer to what’s going on with Musetta and Marcello (I feel there are so many little things you can do there to add to the character). But my favorite moments to sing are the duet with Marcello in Act Three, and “Sono andati?” in Act Four, when everybody has left. When Mimì asks, “Have they all left? I was pretending to sleep,” that moment has got to be perfect. L-R: Head of Coach-Accompanists David McDade, Jennifer Black, and Michael Fabiano, at Seattle Opera's 2013 gala. 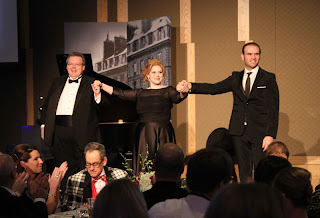 You recently performed at our 2013 gala, along with your Rodolfo, Michael Fabiano. What was that experience like, and what did you sing? It was so glamorous! I love seeing people when they feel good about the way they look, and have gotten dressed up and fancy. Also, it’s fascinating to get to know the audience of an opera company, and every audience is different. These people that I met are so involved. It’s always nice to get a feel of the people who make the opera company thrive and succeed. We did some not-so-standard pieces, which I think the audience was very responsive to, so that was very exciting. I sang the “potion aria” from Roméo et Juliette, which is usually cut when it’s performed, but it’s becoming more common these days because of the way Juliette is being cast. She starts out as a young girl and then matures very quickly throughout the story, so the potion aria is heavier and has a lot more weight than her first aria does. I also sang “Chi il bel sogno” from La Rondine, and that is one of the soprano national anthems—but the opera isn’t done very often. And then Michael and I did the duet from Manon, the Saint-Sulpice scene, which is very, very passionate. What’s next for you, after you leave Seattle? I think I have five days off, and then I go to Toulouse, France, for Don Pasquale and my first Norina. Her character is completely different from Mimì, so that’ll be fun!